Bioanalytical chemistry, biophysics and biomedical engineering make up Weihong Tan’s world of research. “The overall objectives of our research program are to study single living cells and their subcellular structures, and to investigate molecular interactions such as protein-DNA and protein-protein binding,” Tan says. 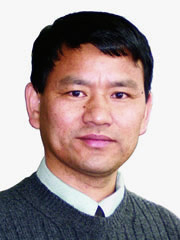 Tan and his team address a number of important problems in biomedical science, such as cancer proteomics and neurogenomics, molecular engineering, bionanosciences and surface chemistry. In a practical sense, Tan’s research may lead to early diagnosis of disease and more effective treatments. “Professor Tan helped define these areas at UF, long before the University of Florida’s Strategic Plan included them as targeted areas of emphasis,” says David Richardson, chair of the chemistry department. Tan’s group has developed other nanoparticles that may be used to identify bacteria or viruses in meat inspection, water quality testing and bioterrorism monitoring. “My favorite part about the research is the bionanotechnology and molecular engineeering, both of which combine chemistry and nanotechnology for significant biomedical problems,” Tan says.